Ricardo Campbell Lindsell was born in Buenos Aires, Argentina in 1916. He completed his studies in England (Stowe College) and then returned to Argentina where he started to work in Alpargatas, a very famous factory of fabrics. Months after war broke out, Ricardo (or Richard) traveled to Canada in the transport ship S.S. Uruguay. Many other volunteers where with him, some of them achieving important ranks and fame during the war. This was October 1940. In December they all joined the RCAF and Ricardo was trained close to where I leave, in Mount Hope, Ontario (EFTS 10), then moving to Brantford, Nova Scotia and finally when training was over, he was sent to England by ship in May 1941. Ricardo was transferred to OTU 13 were he trained to fly Blenheims. On August 16th, 1941 Ricardo was posted to 139 Sqn based in Manston. Other Argentineans were posted in this squadron: George Hughes, Kenneth Hale, Frankie Bell. They flew circuses and also attacked shipping at 0 feet in the Channel. These were the times of the heroic Group 2 missions. During one of the circuses he was in one of the Blenheims that participated in the mission that dropped new legs for Douglas Bader (along with some bombs!) who was then a POW. During another mission, he led 39 Hurricanes that took off from HMS Ark Royal to reinforce Malta. From there the Blenheims continued to Cairo. They stayed in Cairo for some days and then they returned to Plymouth in a Sunderland. Their operations with 139 Sqn resumed on January 9, 1942. He managed to find a German Task force (Scharnhorst and Gneisenau) on February 25th and thought he was shot at by the German ack-ack, he managed to escape into cloud undamaged. At the end of February he became Squadron Leader and got married with a WAAF. And at the same time, he was assigned to 110 Sqn in the Far East. In all, he had completed: Circus operations (France, occupied territory) 3 hours, shipping sweeps (Dutch coast, etc.) 12 hours 25 minutes, night intruder sorties to Holland 2 hours 50 minutes, Scharnhorst and Gneisenau ops (12 Feb 42) 3 hours 15 minutes. Leading 110 Sqn Blenheims Ricardo fought some heavy storms and managed to land in Gibraltar. From there he led Spits that launched from HMS Eagle. They arrived in the beleaguered island and witnessed the hot reception that the Germans had in store for them. The following day, March 22nd, 1942 the Blenheims continued their trip with stops in Cairo, Aquir, Habaygya, Bahrein, Sharah, Jask Jiwani and finally Karachi. Three Hurricanes had flown with them. His plane was Z7293. From there they rested for three months at Quetta. Training to convert to Vultee Vengeance started and they had to leave their Blenheims. He became Flight Lieutenant at the end of the year. On March 30th, 1943 he was informed that he was again a Squadron Leader, and that he was being transferred to 60 Sqn, flying Blenheims. This squadron still had Blenheims and in April 1943 Ricardo led the squadron in his first mission as their commander, bombing Japanese positions at Pinshe. Thinganet, Sowebo, Atwin, Paletna, Kappagyaung and other targets followed as the Army was requesting support. Conditions in the base were very basic but still managed to carry out many successful missions. In August they started training in Hurricanes at Madras. During November and December they escorted Dakotas, Wellingtons and Vultee Vengeance bombers. His Hurricane in 60 Sqn was LE264 (MU*L). He named it Suertudo (Lucky) and had the famous Argentine cartoon Patoruzu painted on the right side of the nose. Patoruzu was a very resourceful native that fought injustice with his great heart and simple weapons. January 1944 saw the Hurribombers starting their ground attack missions. With two 250 lb bombs and their 4 x 20 mm guns, they created havoc in the Japanese positions. On March 8th, 1944 4 sections of 3 Hurricanes flying in “V” were flying and awaiting orders to bomb Mayu. Suddenly, the plane flown by another Argentine (Frankie Hall, who had flown in the Battle of Britain) started to dive with no apparent damage. Ricardo shouted: ”Frankie, get out, get out!” but to no avail. Plane and pilot crashed closed to some huts and left a huge crater. Years later, when discussing this incident with fellow pilots “Chota” Bambridge and Tony Justsum, they reminded Lindsell that after Hall had crashed he told his pilots to open their hoods in order to prevent any potential build up of carbon monoxide, assuming that that could have been the reason why Hall had not answered and crashed. The bridge at Ukhrul was a vital target as thru this the Japanese were reinforcing their Army. It was made of wood, bamboo and other materials taken from the jungle. In May Lindsell and his wingman Shephard attacked it and caught some soldiers crossing it by surprise. Thought they tried to fight back, the combination of 20 mm guns and bombs made short work of the enemies. The bridge blew up. During those days, 60 Sqn along with 113 and 34 Sqn were giving close support to the Chindits. There was a bunker in a hill from where the Japanese were giving a hard time to the British troops. 60 Sqn was called and they attacked while they were being fired at from the bunker. The Japanese never ceased to fire even when they were being attacked. Some bombs hit the bunker and the troops started to climb again but the Japanese opened fired again and cut down several British. The Hurribombers were called again. All bombs were dropped on the bunker and when the Chindits arrived, all the Japanese were dead. In Kohima the Hurricanes of 60Sqn fought with great distinction, destroying bridges, bunkers, fuel depots and even a radar site that was heavily protected by AA guns. In January 1945 he was sent to Canada were he left the RCAF. In May 1945 he returned to Argentina by plane and in September he returned to his old work at Alpargatas. He worked there for almost 2 years and then returned to the UK where he worked for 9 years. Then he went to live in 1955 to Venezuela, in 1967 back to the UK, and then Spain. Ricardo Campbell Lindsell died in England in October 1988. Out of his group of 16 volunteers, only 3 survived the war (among them Malcolm Benitz who was brother in law of “Pancho” le Bas, another Argentine who flew in Malta and had a long career in the RAF after the war). This is the well-known and “old” Hobbycraft kit. 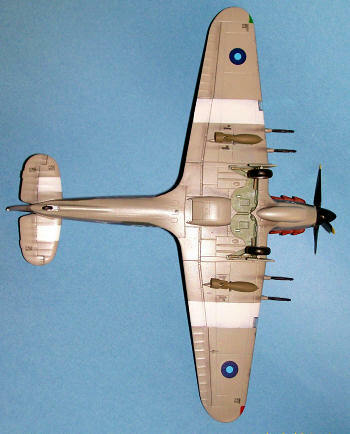 Simple, with several panels missing or wrong, but makes a decent Hurricane Mk IIC. No matter what HC claims and sells, you cannot make a IIB or IID unless you do some dramatic re scribing of panel lines to represent the access to the machine guns. From my point of view, you can only make an IIC. The interior is very Spartan but also you won’t be able to see a lot thru the canopy. I painted all the interior of the cockpit, radiator and wheel wells in RAF interior green (MM Acryl 4850). Details were picked up using a dry brush with aluminium piant. Knobs in black here and there. The instrument panel is black with drops of Future in the dials. The seat was given a hand of Future with a brush and when it was dry I added some seatbelts I had left aside from Tamiya’s Beaufighter. Putting together the main subcomponents was painless and fit is quite good. The most important defect is that there are several panel lines incomplete (present on the top of the wings but missing on the bottom, as an example the border of attack). Others, to name a few, include the ones around the ejection holes for the guns (which are also inexistent!) and the three panels after the radiator under the fuselage. The access doors to the guns are too long so I covered them with putty and re scribed them. There was a little gap between the fuselage and the wings union. Like always, when it comes to such small places and when I run the risk of loosing details when sanding, I use acrylic base. It is a white paste that I apply with a brush, let it dry for no more than 2 minutes and then I remove (the excess) using a damp cloth across the line (not following the panel or you will loose the base that got in the gap). I glued the horizontal tail surfaces and the guns. The wheel wells were masked along with the cockpit and the radiator. All panel lines were pre shaded in black. Then the plane was given a coat of MM Acryl 4759 all over. 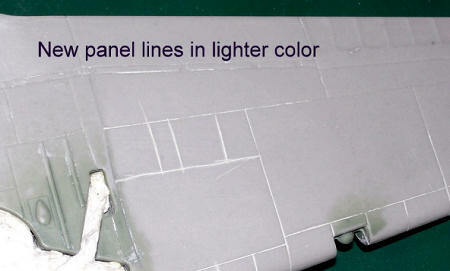 This would give a good base for the white ID bands and also check for potential defects in my panels. With white then, after the grey was dry, I painted the white ID (MM Acryl 4696) bands typical of the SEA theatre. Pictures in the book by Meunier are very clear and show exactly how to paint this bands that varied from plane to plane. With sanded black/brown pastel and a brush I made the stains for the engine exhausts, moveable surfaces, cannons, ejection holes in the wings (where I was going to place the holes made with decals), oil stains under the fuselage. With a sharpened pencil I highlighted the moveable surfaces. A silver pen was used to “chip” some paint here and there. Several layers of Future sealed the colours and the stains. By then I had added the main landing gear. Decals from Condor Decals are, in my opinion, oversized. If you take the actual size of the tail bands (azure and blue), decals are 3 mm too large. Main letters are also too large when compared to the pictures I have seen. Probably the 1/72nd would have worked better? 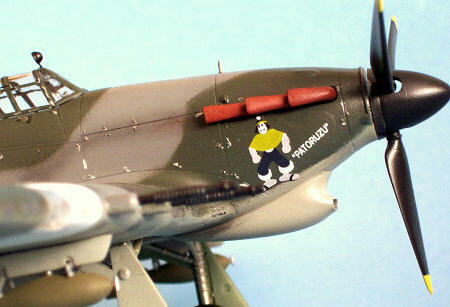 Anyway, I trimmed the decals for the bands on the tail. I added all the rest of the decals from Condor. The white part of the feather above Patoruzu’s head is missing so I painted it carefully with white. Now, the HC kit has no stencils at all. I scanned them from other kits and printed in clear decal paper. Regarding the guns ejection holes, I took them from some scale planes, reduced them to size required for my model, and printed also printed them in clear decal paper. Once these homemade decals were printed, I covered them with a carefully applied layer of Testor Decal Bonder. Stencils were applied and the kit was given a coat of semi gloss varnish. At this point, I realized that the Hasegawa MkIIB Hurricane that I have and will build as Nana Adamson’s SEAC Hurricane has the 250 lb. bombs. So I used them for this Hurribomber along with the stations. These don’t have the same profile, as there seems to be a difference between the Hase and HC wings. So I had to sand the profile before being able to glue them in place. 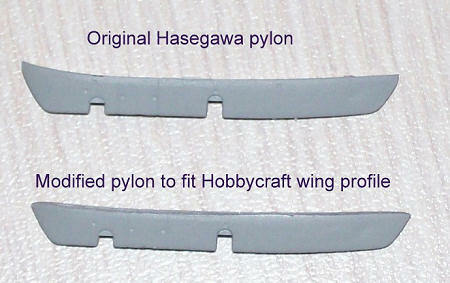 From the Hasegawa MkIa Squadron Leader I took the not needed pieces: the long propeller spinner for an MkII and the knuckled tail wheel (the one supplied by HC is for a MkI). I added the gunsights (reflector and scratch built bead on top of nose), the hood and windshield and the two handles outside the hood (made up of black bristles). The light under the fuselage was taken from the spares (not supplied by HC). I painted the navigation lights in red, green and white. The rear mirror is made of two parts: photo etched (True Details 48710) painted in chrome silver and the tip of a bomb for the rounded part. I had to add this part of plastic or the mirror would have been flat had I used only the photo etched piece. I added the bombs, cover for main landing lights that I painted in chrome silver, Pitot tube, exhausts (painted in rust MM Acryl 4675 and black) and the wheels along with the wheel doors. The navigation light behind the cockpit was taken from the spares (Hasegawa’s P-40). I added the antenna mast and the plane was ready. Thanks for your help, Claudio! And also because you are bringing to light all those unknown stories about the Argentines that flew with the RAF and RCAF in WWII. Post script regarding my Spitfire MkIX flown by Ken Charney: Claudio Meunier has finally made it possible, and early in 2011 Ken’s remains will be send back from Andorra to his native Bahia Blanca.